Jon Snow sushi straight from The Westeros! Generally, we are told not to play with our food, but where Hu is concerned, it has surely paid him well and brought in a huge chunk of followers. Employed at Sakana Sushi — a Japanese restaurant in Milan, Italy, this young chef is not only a foodie at heart but also a sports lover and that explains his obsession with sculpturing Adidas and Nike’s sneakers. Each of Yujia's sushi-celebrity is made of seaweed nori and raw pink fish with a rice base. Some popular celebrities and characters who were objects of Hu’s creations include Game of Thrones' Jon Snow, The Mountain, and Pirates of the Carribean's Jack Sparrow among others. If you pick Lonzo you got also Lavar. Yujia Hu never forgets to please the sports fans in his audience as well. 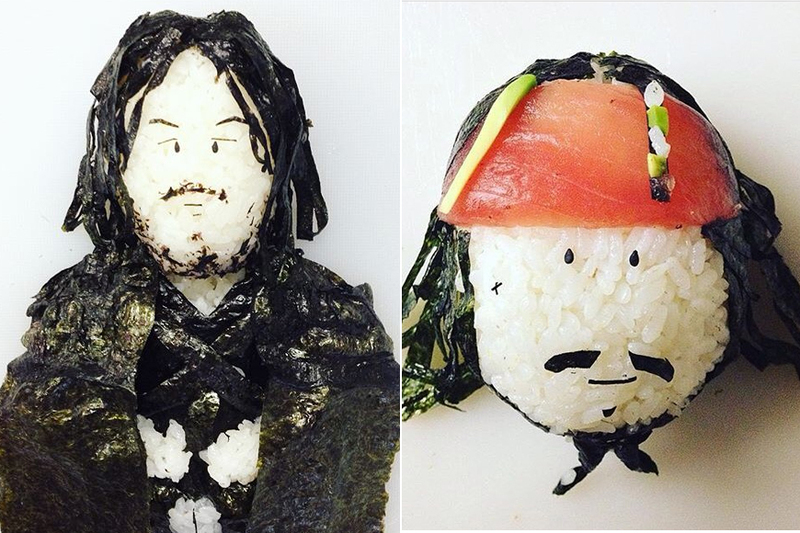 Jon Snow is sushi-ready to take the throne. And so is The Mountain of rice. And of course, Obama just had to be included in one of these. Here's a pablo-sushi bar for Narcos fans.